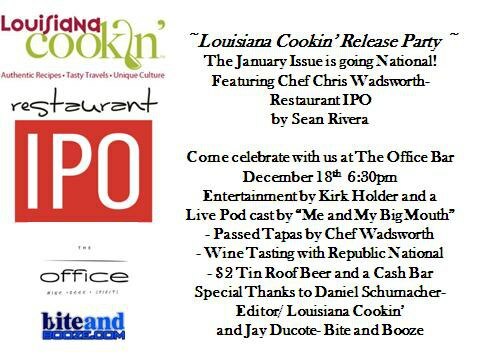 Come join me at The Office and Restaurant IPO on Tuesday December 18th for a release party! I'm excited to see the new January/February issue of Louisiana Cookin' Magazine. I have a column in it, and local food writer Sean Rivera's first published writing in the magazine comes in the form of a profile on Restaurant IPO's own Chris Wadsworth! For more on Chef Wadsworth, take a listen to his appearance on the Bite and Booze Radio Show presented by Calandro's Supermarket! Hey Jay, It's Megan Champagne. I've been away from the blog world for awhile, but I figured out a way to read them more easily. Glad to see you are still blogging!